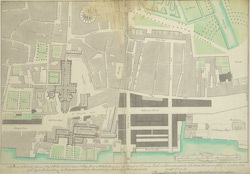 Thomas Lediard was the agent and surveyor for the Commission for Streets and Waterways. Westminster bridge, the first major bridge to be built across the Thames since the medieval London Bridge, is marked as "New Bridge". The expansion of Westminster in the 18th century necessitated an alternative to the timber Putney Bridge, the only river crossing west of the City. The grey blocks featured on this map are new buildings on the new streets near the approach to Westminster Bridge.